What you put on you skin is important and what you put inside your body is even more important. Unfortunately, I am really bad about being consistent with both of these things but I am trying to get better. I have had most of these ingredients in my pantry in the past and I hate to admit I’ve never finished a bag of any of them, except chia seeds which I didn’t add to this recipe but you easily could. 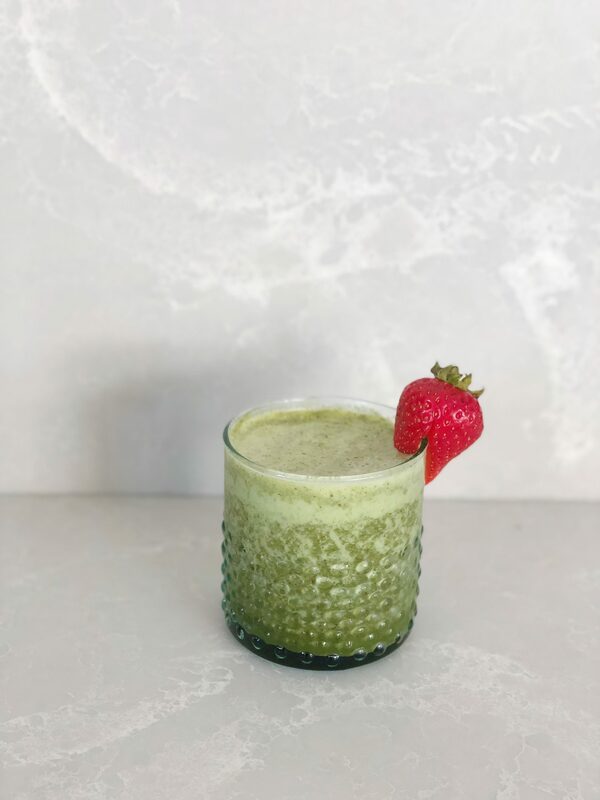 Now that I am in my 30’s I know I need to nourish my body and I have become better at being consistent with a beauty and healthy routine, especially in the mornings which is the perfect time to drink my beauty smoothie. I love having smoothies packed with nutrients, they are easy to make and great for my body. A short three years ago my smoothie recipes didn’t contain protein powder to my smoothies let alone maca powder and collagen. Some supplements and vitamins can taste bad but when you add other yummy ingredients you can’t tell. 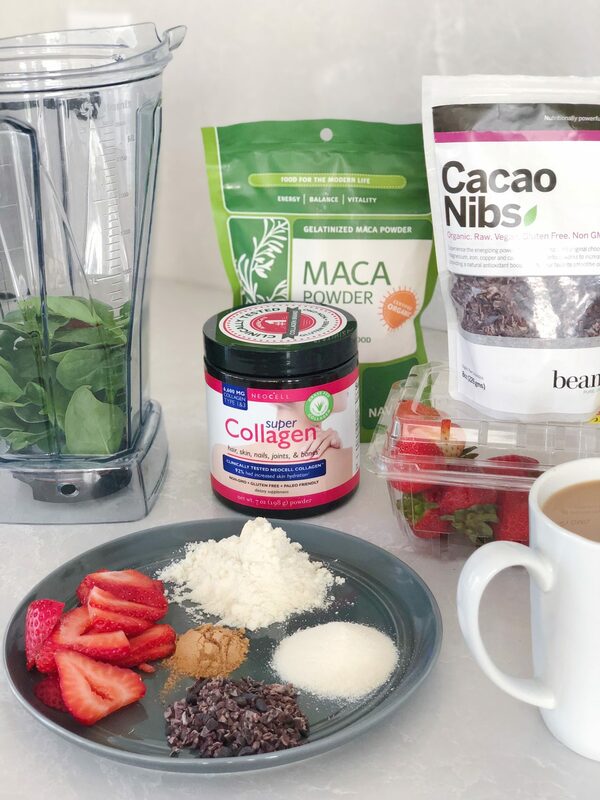 The taste of maca powder can be a bit much so stick to the serving size of 1 teaspoon, cacao nibs aren’t the best when you eat them but when blended in a smoothie adds just enough sweetness and hint of chocolate, collagen has no taste and I think we all know what protein powder taste like. I also like to add spinach to just about every smoothie I make because it doesn’t have much of a taste and is packed with many vitamins. protien powder – Helps sustain energy throughout the day. I love to snack but adding protein fills me up just enough to help me make it to my next meal. maca powder – Maca is a root vegetable that has an earthy flavor and I do not recommend adding too much. It is packed with iron and vitamin C and supports daily energy. cacao nibs – Somewhat of an unprocessed form of chocolate. It is filled with antioxidants, helps boost energy, prevents premature aging, burns fat and is high in fiber. collagen powder – Collagen has anti-aging benefits for your skin, hair, nails, joints, and it promotes a healthy immune system. My husband takes it and I always thought it was for his joints and tendons only. Once I learned the benefits I started adding his collagen to my smoothies but now I have my own! Hope you enjoy this beauty smoothie!